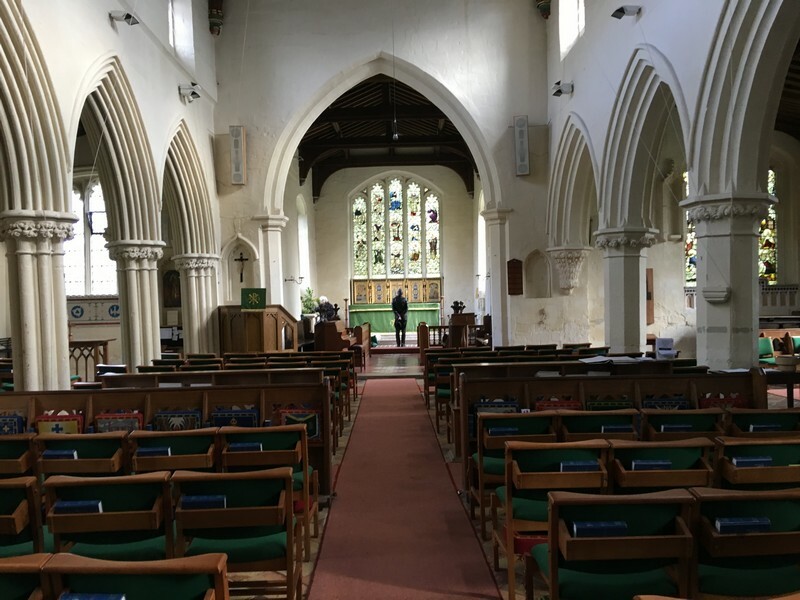 Tearle family history in Eaton Bray, Bedfordshire. 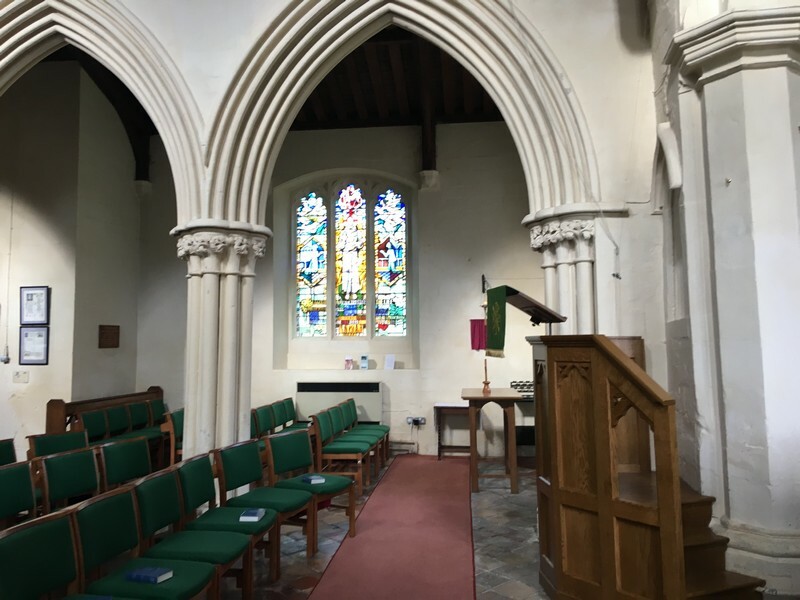 The vicar of Stanbridge, Helen Gardiner, wrote to me to say she had seen mention of a Tearle in the Church of St Mary’s, Eaton Bray. She thought it was on the lectern. 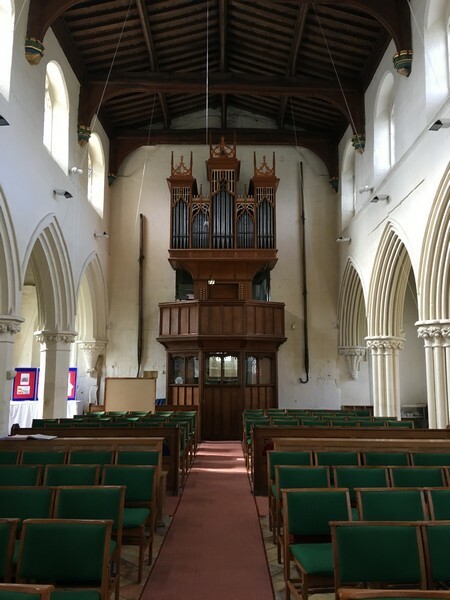 This was of great interest because Eaton Bray is one of the Tearle Valley villages, which we had visited, but on all occasions, St Mary’s was closed. This time (Feb 2017) we were lucky, a very pleasant and knowledgeable lady was arranging flowers for the coming weekend services and she was happy to have company while she did so. 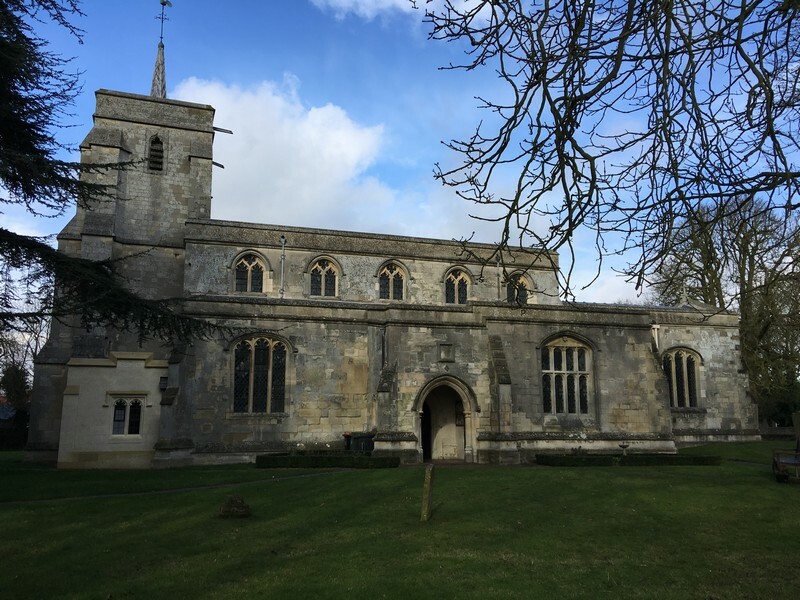 St Mary’s is an old and beautiful church built in the 1200s, so it is not a classic Norman design, but it is tall and of ample proportions, with a few additions that had been tidily added over the centuries of its life. 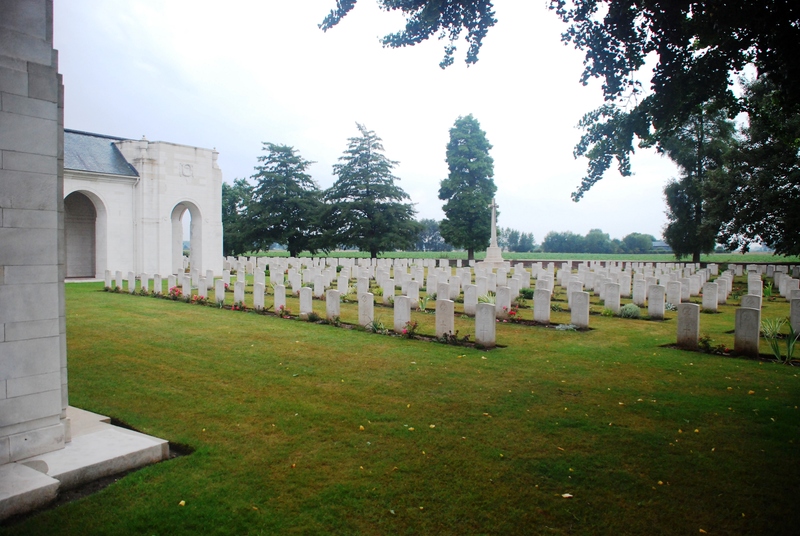 Very few of its headstones are left; some are leaning against two perimeter walls, and a block of concrete had little plaques of the names of villagers who had been cremated. 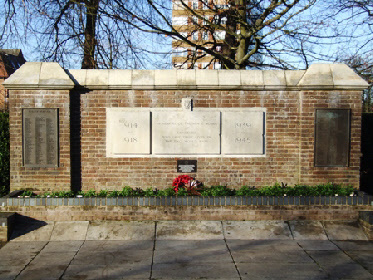 A war memorial took pride of place at the head of the pedestrian access to the building. We examined everything we could find for Tearle names, but there was nothing, in spite of there being Tearles in Eaton Bray since at least the early 1700s. The first impression of the interior of the church is that it is filled with light and it is well maintained. A glance over your shoulder exposes the quite beautiful pipe organ attached to a wall behind which is the belfry. I asked the flower lady about the organ and she said there were recitals in the church, and they were well attended. Over time, some quite beautiful stained glass windows had been added. We set about trying to find the Tearle memorial that Rev Helen Gardiner had referred to. 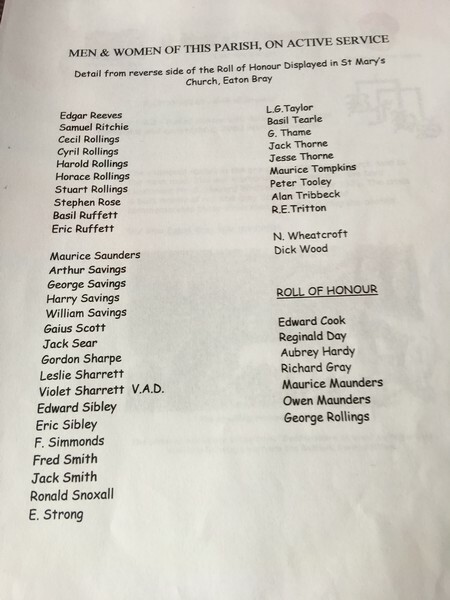 First, though, was a complete surprise; a Roll of Honour with the name Robert Tearle. He had been born in Eaton Bray in 1887 and died in 1962. 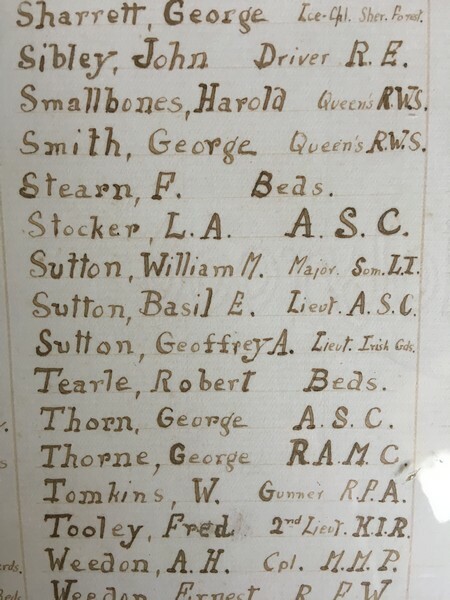 Below is the reference in closeup: “Beds” refers to his original enrollment as a private in the Bedfordshire Regiment. 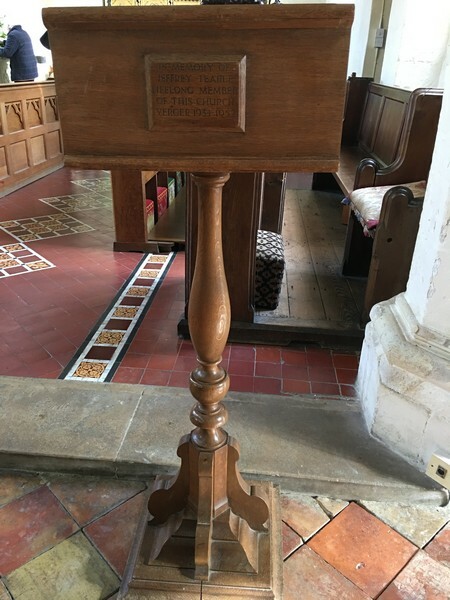 Then we found the lectern and the name of the Tearle we had come to find: it was Jeffrey, born in Eaton Bray in 1874, who died in 1952. 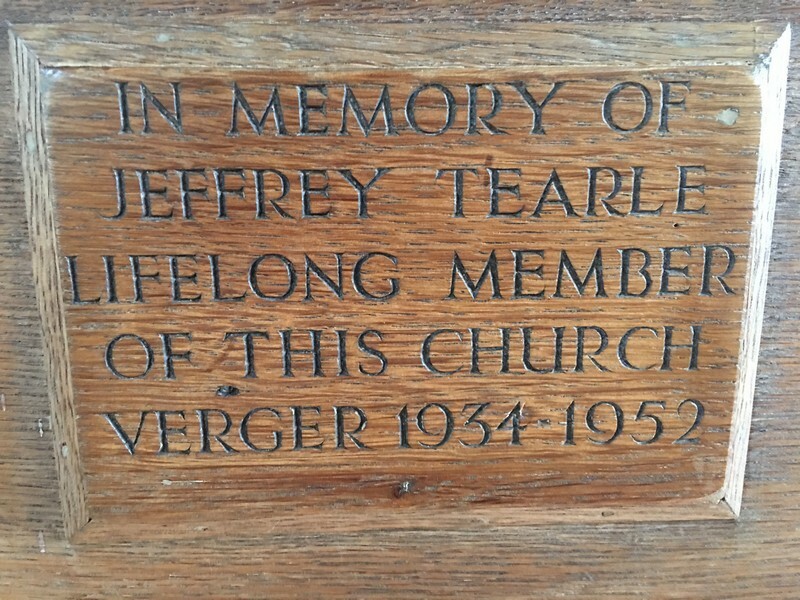 We were very touched; Jeffrey had continued his work as church verger, literally until he died. 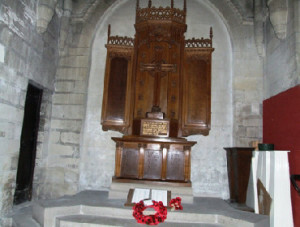 But there was one more surprise; underneath the organ was a display which included a booklet on the Roll of Honour which, when it had been taken from its original hanging place was found to contain a note of all the villagers who had served in the Second World War, and amongst those was Jeffrey’s son Basil Jeffrey Tearle, who was born in Eaton Bray in 1921.
Who were these men, and what do we know about them? Let’s start with Robert. He was born in 1887, so he was only 27 when WW1 started. He was always going to be drawn into that massive conflict which raged across Europe for four years at the cost of approximately 10 million military lives, and around 6 million civilian casualties. Robert Tearle 1887, of Eaton Bray, was born to Alfred Tearle and Mary Ann nee Roe, also of Eaton Bray, on the 15 Sep 1887. His parents took a little while to baptise him, but that did take place, on 4 Sep 1890. He was the eldest of four children – Doris May in 1899, Arnott in 1900 and Aubrey in 1903 all followed him. Alfred and Mary Ann were married in 1887, in the beautiful church you can see above. In 1911, when Frederick filled in the census form, he was a bootmaker and poultry farmer, working from home. Robert was 23yrs old and he was a shoemaker and repairer, working on his “own account” presumably from the same address. The other children were at school. In order to show you Robert’s ancestry, I need to digress for a moment and show you an outline of the Tearle tree from Alfred and backwards into history. Alfred’s father was William Tearle, born 1830, in Eaton Bray, who married Harriet Janes, of Eaton Bray, in 1851. They had three children, Hannah 1852, Tabitha 1854 and George 1856, who died in 1873. Remember Tabitha; we shall see her again. In 1858 Harriett died, aged just 28yrs. I’m afraid I do not know why. With three small children on his hands, William married Ann Rogers of Leighton Buzzard in 1861, in the beautiful little church above, St Mary’s of Eaton Bray. At the time, she was a single mother with a son, John Rogers (named after her father) born 1857. The couple had seven children, of whom Frederick was second. Jonas, the first of their Tearle children was born and tragically died in 1861 at what cost to his parents, we cannot tell. Most of the Tearle children who were born after Alfred moved to the industrial areas of Northamptonshire, to become machinists and boot makers, and here is why: in 1849, a branch railway line was opened from Stanbridgeford to Dunstable; it was a walk of a few miles from Eaton Bray to the station, but only a few hundred yards from Stanbridge, and the people of Tearle Valley could take advantage of the opportunities in the new industrial cities to rid themselves of the sometimes intolerable grind of rural poverty. William’s parents were George Tearle 1797, of Eaton Bray and Mary nee Hill of Hallibridge, near Spalding, in Lincolnshire. How they met is anyone’s guess, because people tended not to travel much outside their immediate countryside, if only because travel was difficult, dirty, expensive, and sometimes hazardous. George’s parents were Thomas 1763 of Stanbridge, and Mary nee Gurney of Eaton Bray. In this marriage, we can see the movement of one family from the ancestral home of the Tearles in Stanbridge, to a village still in the same well-defined valley, about 4 miles away. And there they stayed, until the children of Alfred heard the call to the cities not particularly far from home. Thomas’ parents were John Tearle 1741 of Stanbridge and Martha nee Archer. They had seven children, of whom Thomas was the second. 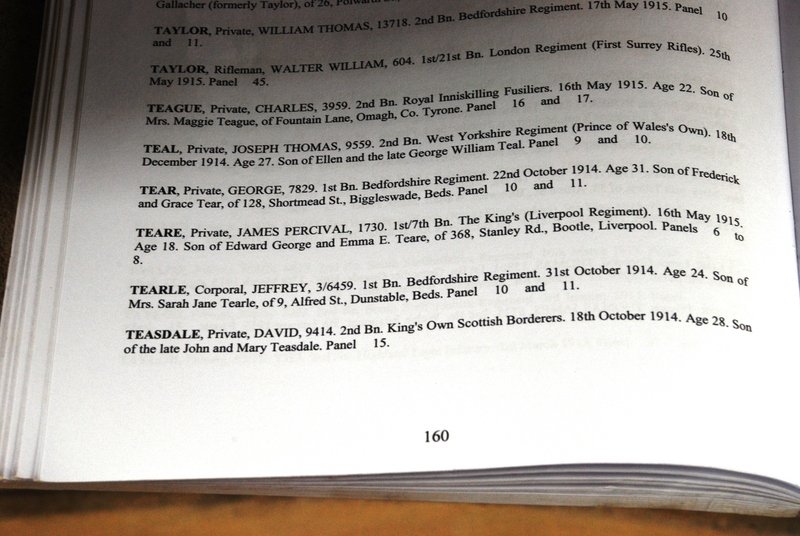 John’s parents were Thomas Tearle 1709 and Mary nee Sibley. In another essay on this site, I have explored the relationships and events that lead to the marriage of Thomas and Mary, but the Tree now goes back to John Tearle of Stanbridge born about 1560, and with a few gaps here and there, the story of the Tearles in and around Tearle Valley goes back as far as the late 1300s. 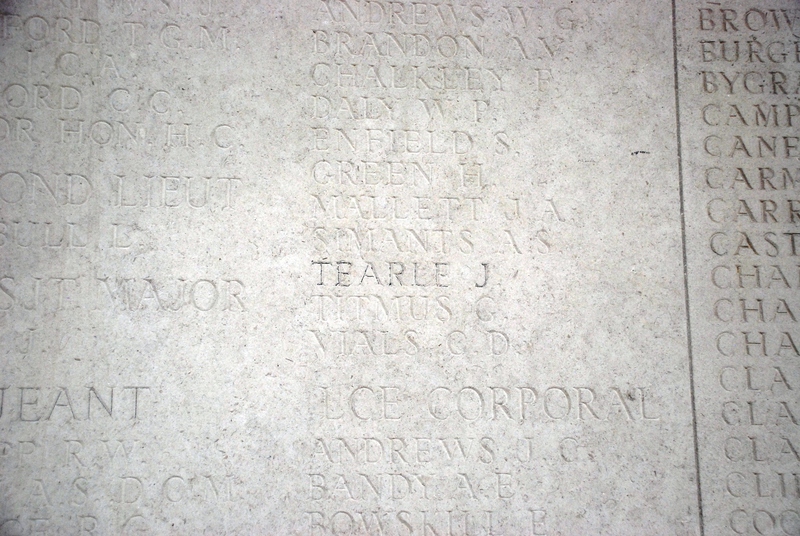 On the Roll of Honour in the Dunstable Priory Church, there are two names: Tearle G and Tearle J. The first is George Tearle, born 1876 in Dunstable; the second is Jeffrey Tearle, born 1891 in Eaton Bray. They are only distantly related. Below is a picture of the War Memorial in the grounds of the Dunstable Priory Church. Here is Jeffrey’s service record from the CWGC. Rank:Corporal Regiment/Service: Bedfordshire Regt Unit Text:1st Bn. Casualty Type: Commonwealth War Dead Grave/Memorial Reference:Panel 10 and 11. War memorial inside the gates of Dunstable Priory Church. Jeffrey was born 1891 in Eaton Bray and his parents were George 1861 of Edlesborough and Sarah Jane nee Horn. 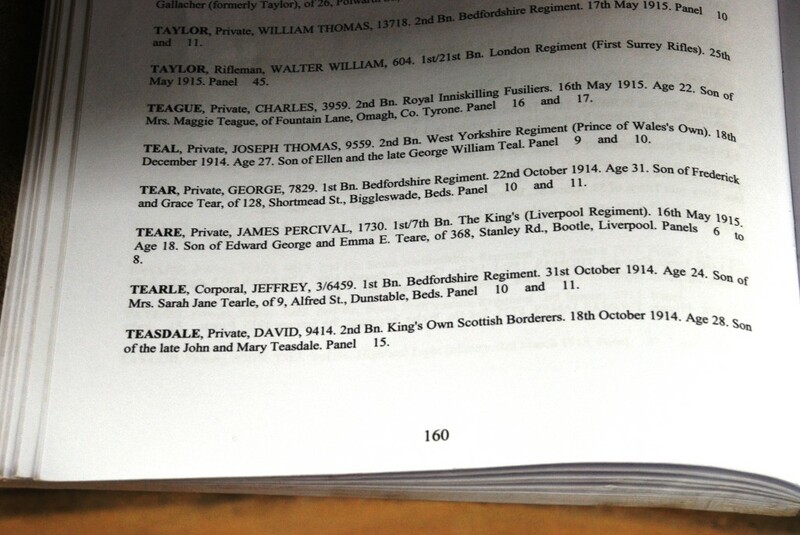 He was the brother of Frank Tearle 1898 also of Eaton Bray. George 1861 was the son of George 1831 and Hannah Maria nee Janes. George 1831 was the son of Jabez 1792 and Mary nee Green and his parents were William 1749 and Mary nee Prentice. Thus Jeffrey is of the branch William 1749. George 1876, the other Tearle man on the memorial, descends from Joseph 1737 and Phoebe nee Capp, via Charles Bowler Tearle and Constance Cleaver nee Dickens. Jeffrey and George are 4th cousins. 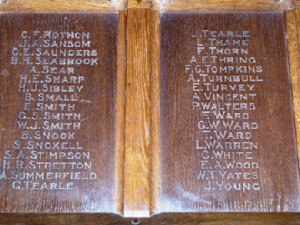 Panel of WW1 casualties on Dunstable Church war memorial. 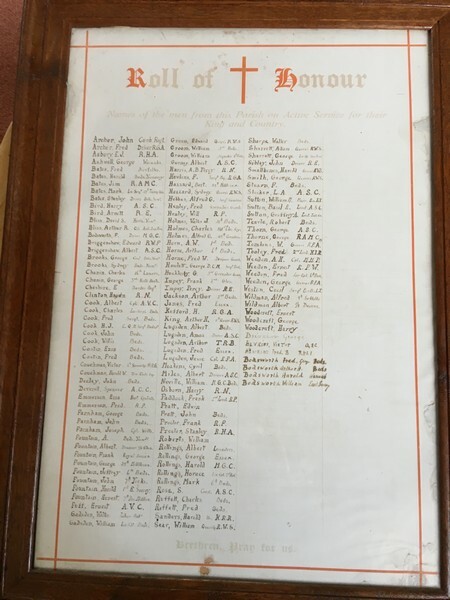 Roll of Honour inside Dunstable Priory Church. 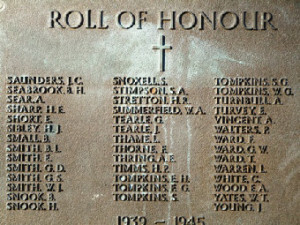 Closeup of Roll of Honour inside Dunstable Priory Church. 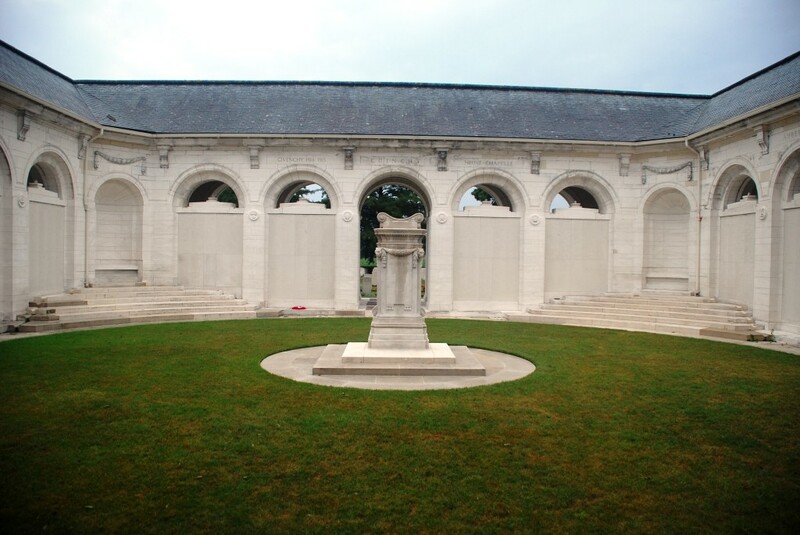 Jeffrey does not have a headstone at Le Touret Military Cemetery, he is remembered by inscription on the Bedfordshire Regiment section of the Le Touret Memorial. Here is Le Touret Memorial it remembers the names of more than 13,000 soldiers “who have no known grave” and were killed in the Le Basse – Bethune area of Pas de Calais. Jeffrey Tearle in Le Touret Book of Remembrance.